with a 0.1 °C or 1 °C resolution and assured accuracy of ±1 °C over the range 0 to 100 °C. The RayTemp® 2 incorporates a 5:1 optic ratio (target distance/diameter ratio) and a fixed emissivity of 0.95 making it suitable for a wide range of food and industrial applications. The unit do not have a laser light. 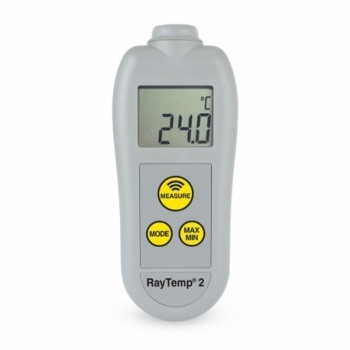 The RayTemp® 2 has a three buttons measure, mode and max/min functions, pressing the mode button allows the user to select °C/°F, display the ambient temperature and the emissivity value.